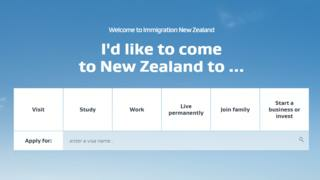 New Zealand's immigration website has said it saw a surge in traffic, as the results of the US election came in. Canada's immigration website also received a high amount of traffic on Wednesday, causing it to crash. Donald Trump secured a surprise victory in the presidential election. New Zealand Now's website, which contains information about living, working, studying and investing in the country, also saw a similar spike in traffic. "In the 24 hours up to 9am local time on Wednesday, NZ Now received 70,500 visits from the US compared to a usual daily average of 1,500 visits," said INZ marketing manager Greg Forsythe in a statement to the BBC. Online, some Americans expressed that their interest to move to New Zealand was a result of Mr Trump's victory. However, he added that these were purely "registrations of interest" and not visa applications.